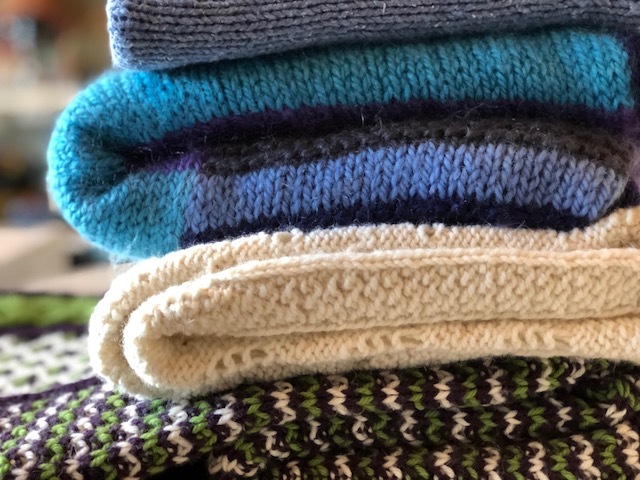 We know how very generous our PBYS knitting and crocheting community is-- drives for Knitted Knockers, Hats and Scarves for the needy- and we're so pleased to have a new organization to work with: CASA Ulster County. (Court Appointed Special Advocates (CASA) of Ulster County). Click through here for more info. Our friends at CASA explained how children in foster care often travel from one home to another with their worldly possessions carried in trash bags. A sobering thought, but how wonderful that CASA was recently awarded a grant that will allow them to provide each child with a duffel bag which they can call their own. And then they thought- wouldn’t be nice if the Duffels came with a cozy little lap blanket? We knew the PBYS community would love to be in on this! We will have open lap blanket KAL/CAL on the first Monday of the next three months (February, March and April, 6-8pm). Bring your bits and bobs from other projects (washable fibers preferred) and join us! Any/All yarns welcome! Knit or crochet a blanket! And of course, we’d love to hear of any other ways you’d like to participate! The First KAL/CAL will be at PBYS on Monday February 5!